Cheese is glorious, as is bread. So marrying the two seems so natural doesn’t it? 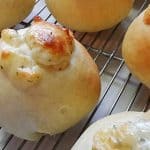 These rolls should be served warm, fresh from the oven, so that you can really enjoy their ooey-gooeyness. So yes, it will require a little timing on your part, but they’re worth it, believe me! I originally came across this recipe on Pinterest. 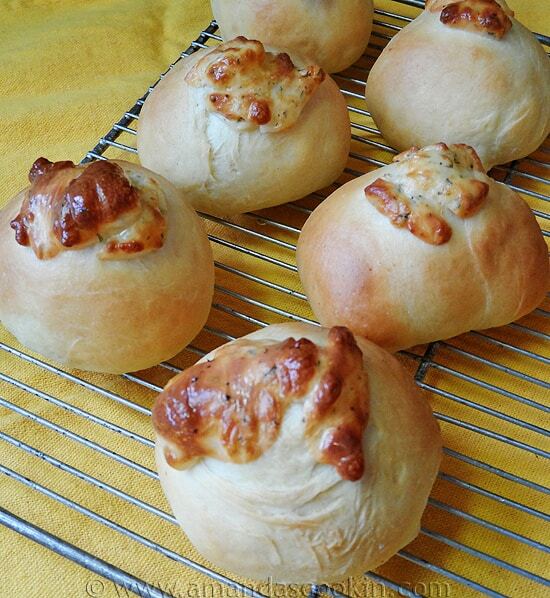 That led me to Yammie’s Noshery where I found these – Peeta’s Stuffed Cheese Buns inspired by the Hunger Games. The fact that the recipe already had garlic powder in it inspired me to use one of my favorite garlic cheeses. You can use mozzarella like they did at Yammie’s if you like. In fact, any melty cheese will do, so adapt as you see fit. I’ll be honest though, when this dough was rising I really was concerned about the amount of garlic powder. The aroma was overpowering. But, after they baked it ended up being the perfect amount. For this recipe I used my KitchenAid stand mixer with the dough hook, and my kitchen scale to weight out the dough. After the dough has risen, punch it down and separate it into 18 equal pieces. I find it easiest to use a kitchen scale for this task! 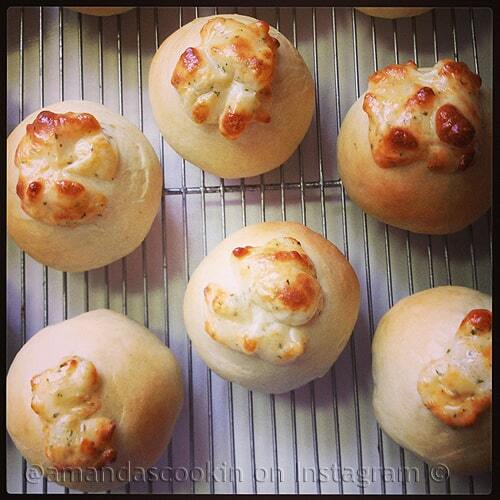 Next, you’ll wrap your cubed cheese inside each piece of dough. Then top with some thin slices of the same cheese and bake. Yum! 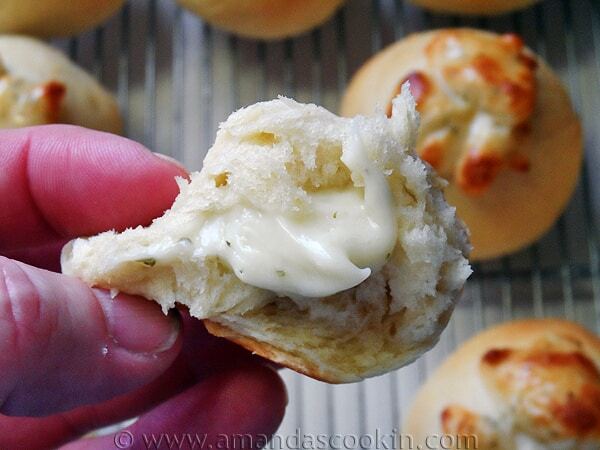 If you are making these for your family’s dinner, I suggest cutting the recipe in half. I made the entire batch and even with each of us enjoying two each, we still had leftovers. They are still tasty afterward, but the cheese isn’t melty anymore and even heating them up wasn’t the same. These were a huge hit, especially with the teenagers. There’s something about gooey cheese that teens love, or at least mine do anyway! Hope you try them, they are delicious! Are you on Instagram? If so, I’d love to connect with you there! Here’s my Instagram link – I’m amandaformaro. Sprinkle yeast over the warm water and let it sit for a few minutes. Once the yeast begins to foam, you can add the sugar, garlic powder, melted butter, oil and salt. Mix together then gradually add the flour, mixing in your stand mixer with a dough hook or by hand. Knead for 10 minutes then place is an oiled bowl and cover with a soft cloth. Let the dough rise for about 30 minutes, or until dough doubles in size. Preheat the oven to 375 F. Line insulated baking sheet with parchment paper. Divide the dough into about 18 equal pieces. 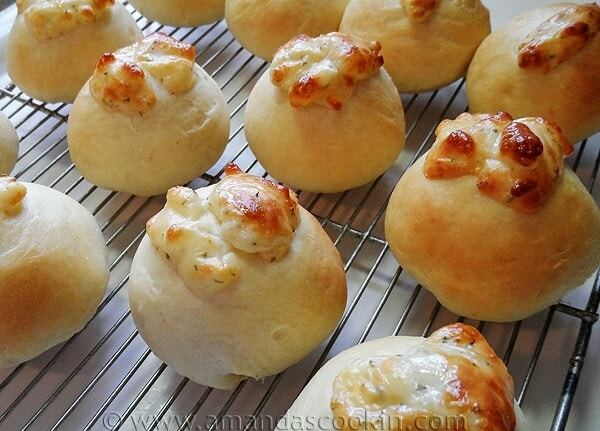 Put about a 3/4-inch chunk of cheese in each one and make sure you pinch all the edges back up tightly. Put the pinched side down on baking sheet. 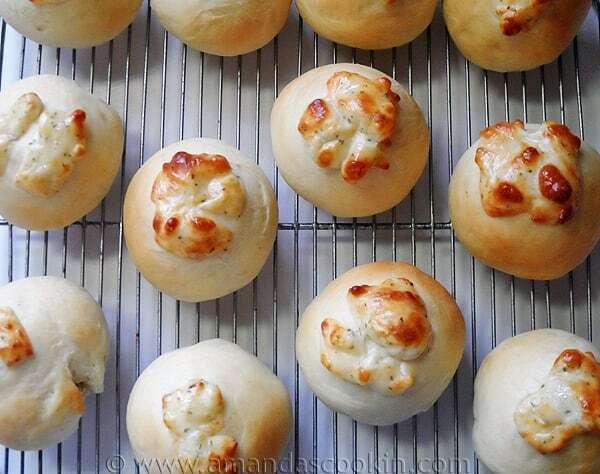 Cut small slices from remaining cheese and place on top of buns. 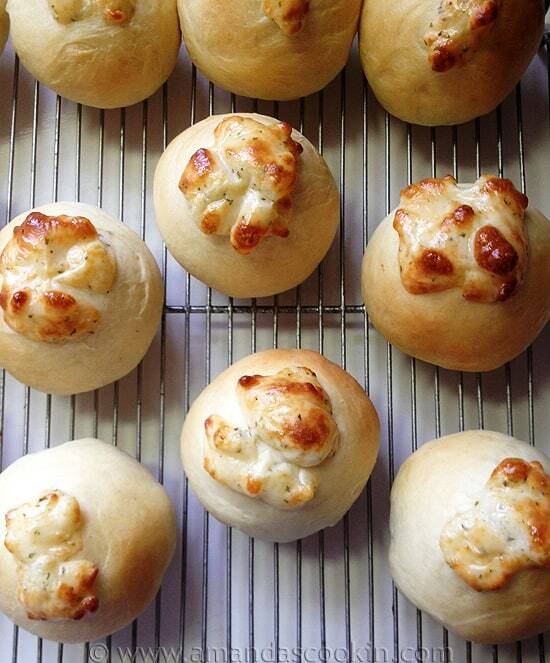 Bake for about 11-15 minutes until the bread is golden brown and the cheese is bubbly. Brush with the melted butter and serve warm. These look amazing!!! I am trying them right now. The dough is rising in my oven and starting to smell pretty good. If I like it (which I a pretty certain is a big YES right now!) I might even do a re-post on my blog. Thanks so much for sharing! I hope they were delicious!